May 27th, 2018 is the 5th annual Dandelion Day Festival to be held at Millennium Park from 11a.m.-4p.m. This annual celebration focuses on healthy lifestyles and the public is invited to enjoy free live music, face painting, children’s activity wall, and a chance to meet local Health Practitioners and local authors. 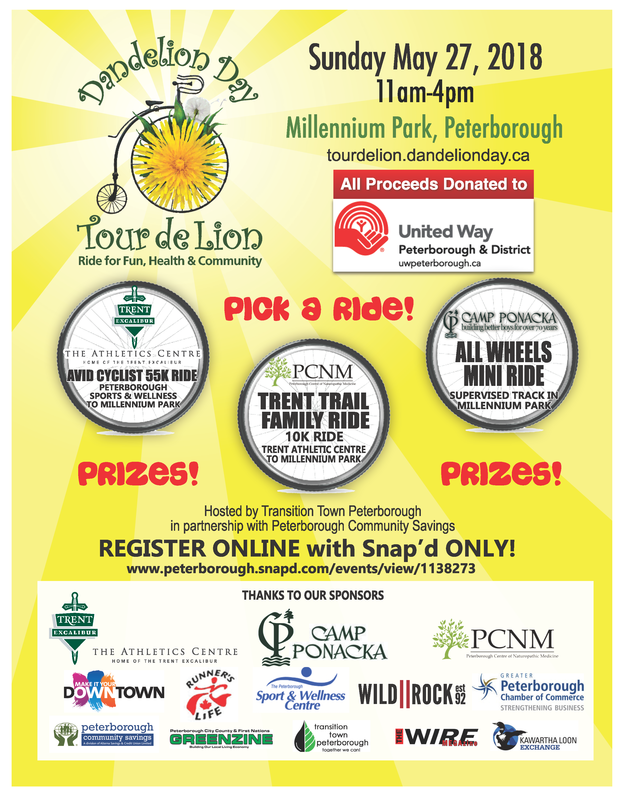 The festival will include a charity bike ride, “Tour de Lion” Ride for Fun Health and Community, which includes 3 different routes. All proceeds from pledges collected will be donated directly to United Way to help in their work of building strong inclusive communities. Click here to read more about Tour de Lion. As we near the end of the 2017 Campaign, United Way volunteers and staff are excited by the current success. With three weeks to go before celebration on March 29th, the Campaign is within 4% of its $1.85 million goal. It’s not just individual donors, local workplaces have spent months fundraising through events and payroll deductions. “The energy and effort at our local workplace Campaigns has been astounding.” praises Lisa Smith, Director of Philanthropic Impact. There is still time to give. Visit the United Way Peterborough website for details. Jim Russell, CEO, remarked on the excitement building around the two new funding streams recently announced by United Way. “Our Innovation fund and Neighbourhood fund are designed to support grassroots projects and to pilot new ideas in the community. It’s this ground-breaking work that is supported by our Campaign.” Russell noted that $100K in new funding is currently available to the community. Click here for application information. Applications are due March 9th at 5pm. We invite you to join us for our Campaign Celebration on March 29th. Click here to purchase tickets! United Way Peterborough & District is inviting nominations for the Scholfield Award of Community Distinction. This award was established to recognize an individual or organization for their outstanding contribution and ability to mobilize change within our community. “Through their excellent leadership, the award recipient energizes and inspires people to come together to make a lasting difference in the City and County of Peterborough,” says Jim Russell, CEO, United Way Peterborough and District. Nominations close March 15, 2018 and the award will be presented during National Volunteer Week (April 15 – 21st, 2018). “Volunteers are a diverse group of people who create a ripple effect of inspiration and generosity. It just makes sense to honour those who go above and beyond in their contributions to our community during National Volunteer Week.” added Russell. In 2004, Paul and Ina Scholfield were the first recipients of this award. The Scholfield’s have been long-time philanthropists and community builders. Through their generosity and commitment, they lead by example, typifying the spirit of community building. Other recipients of this award include: Faith Dickinson, Stephen Kylie, Marie Bongard, Sharon Courts, Paul Lafond, People First, John Martyn, Bill Strode, Roy Brady, Survivors Abreast, John McNutt and Special Olympics – Peterborough. The Scholfield Award is open to any resident or organization within the boundaries of the City and County of Peterborough. Nominees are evaluated based on their achievement, commitment and leadership in addressing community needs or issues; the impact of their efforts; their innovative, unique or exemplary approach; and their success in mobilizing members of our community. 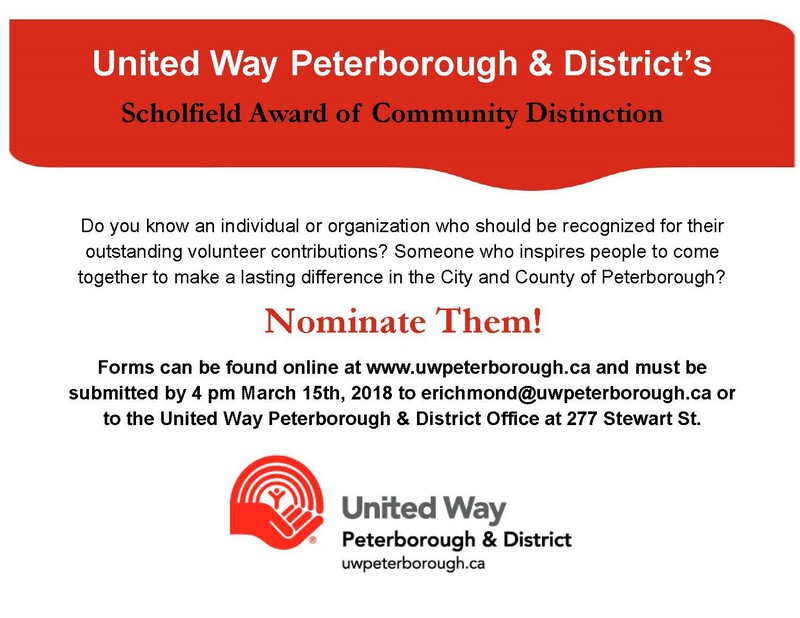 Nomination forms must be submitted no later than 4pm March 15, 2018 to erichmond@uwpeterborough.ca or to the United Way office at 277 Stewart Street, Peterborough.